The Haruhi Suzumiya Wii Game Doesn't Have Dancing? No Wii Haruhi Suzumiya dancing for you! Apparently. 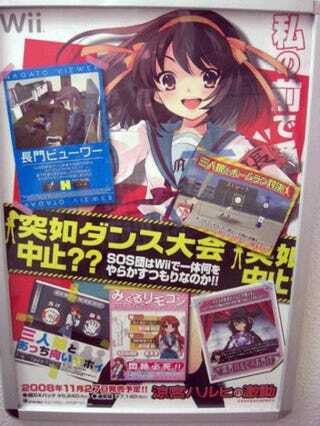 This November is slated to see a Wii title based on popular anime The Meloncoly of Haruhi Suzumiya. Originally, the game was supposed to feature dancing. No, make that Haruhi dancing. But according to this poster, the game will apparently not feature dancing anymore as the poster asks if the dancing has stopped. In its place (we guess), players get an assortment of mini-games. There's a Haruhi fortune telling mini-game, a mini-game called "Nagato Viewer" in which players watch character Nagato, a baseball mini-game as well as a paper, rock, scissors mini-game. The confusing bit is that this official poster isn't exactly saying the dancing is cancelled, but rather, asking in yellow. Maybe it's just an odd advertising campaign trying to focus attention on the game's other aspects or this is just some publicity stunt. And yes, Haruhi dance after the jump.